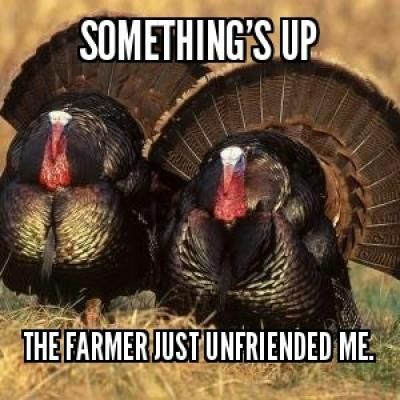 Thanksgiving | The Fringe | Conspiracy, News, Politics, and Fun Forum! Thanksgiving | The Fringe | Conspiracy, News, Politics, and Fun Forum! Thanksgiving The-Fringe | Your #1 Source For Conspiracy, News, Politics, and Fun! D3VILSR3J3CT, Debauchery, FringeDude, phxsparks, PickleSnout, Scent of Cedar, TheOrderOfChaos, WhiteAngel, WNC, ~mc~ likes this! People sleeping through the Detroit Lions game. Thanks to tryptophan or a boring game? Chicago BEARS are going to play against the LIONS. Also, TIGER Woods will play a golf game against Phil Mickelson during the Thanksgiving weekend. LIONS and TIGERS and BEARS, oh my! DRUMZ, Octopus Prime, Scent of Cedar, Sock, St. Blue Dude, TheOrderOfChaos, ~mc~ likes this! (11-08-2018, 09:19 AM)Tolimar Wrote: People sleeping through the Detroit Lions game. Debauchery, Scent of Cedar, TheOrderOfChaos likes this! Debauchery, last one, Octopus Prime, Scent of Cedar, TheOrderOfChaos, Uncle_Thanky, WNC, ~mc~ likes this! Yeah relatives are like fish sitting in the refrigerator for three days, they both need to be thrown out. D3VILSR3J3CT, Debauchery, last one, Scent of Cedar, TheOrderOfChaos, ~mc~ likes this! Blood is everything to me. It's just that with my older bro, at times I love it so much I have to see it. Octopus Prime, Scent of Cedar, TheOrderOfChaos, WhiteAngel, WNC likes this! D3VILSR3J3CT, Scent of Cedar, TheOrderOfChaos likes this! "A bird cried jubilation. In that moment they lived long. All minor motions were stilled and only the great ones were perceived. Beneath them the Earth turned, singing." Apache54, Debauchery, Octopus Prime, TheOrderOfChaos, WhiteAngel, ~mc~ likes this! Apache54, Debauchery, Octopus Prime, PickleSnout, Scent of Cedar, TheOrderOfChaos, ~mc~ likes this!